Suramar questen bis der WQ "Ausbildung der verdorrten Armee" freigeschalten wird. Dann jeweils das Szenario spielen. Chaos! DPS and agro everyone they can find. Will not follow you and stay in the area. Folgt mir! Follow you and try to dps only your target. They will agro mobs sometimes, but not intentionally. Here we have Instabiles Gespenst in the center and some Verdorrter Schlurfer on the sides. Recommendation: Kill sides first and then nuck Verdorrter Schlurfer with Chaos! On low hp it will cast Instabile Explosion .Use stan or kill fast. Recomendation: Don't use Chaos! in this room. only when you have last pack of 3 Instabiles Gespenst. Kills trash Ungefesseltes Arkana and Verdorrter Schlurfer first. And she casts Kristallines Schrapnell on her target. This room has Berserkerhelm von Ondry'el 10 men chest in it. 3 new mobs: Splitterrückenspinnling, Splitterrückenhuscher and Splittermaid. All of them are just trash. There are Instabiles Gespenst on the left and right part of the upper level. 1 Instabiles Gespenst is patroling the center. Recommend to kill him first, before you enter the room. After you killed the patrol, kill sides. Run to the wall, wait for your withered to come near and agro Instabiles Gespenst. Same for the other side. If you want to go there, kite 4 Splittermaid from the center and then go down. This area is simple We already seen most of the mobs, There are some new spider-like trash in the area. You can easily aoe everything, but be carefull and expect Leypirscher Dro miniboss to spawn in the middle of the fight and kill you) Yep he is the hardest boss in this scenario. He can spawn on any pack in this area. It is random, but you will hear the warning "–Look out!". He drops Dros Schlüssel and you need it to open the 2-nd part of the scenario. Stun him and nuck with everything you have and Chaos! This room has 2 10-man chests, but you can't take them both in 1 run, because you need to take Linsen von Zauberseher Dellian first to see hidden chests. He is not hard because at this point you have lots of units in your army, but he has Stampfen and you should try to stun him. Chaos! helps alot in this room. This world quest will be available once you have done Aufbauen einer Armee quest. 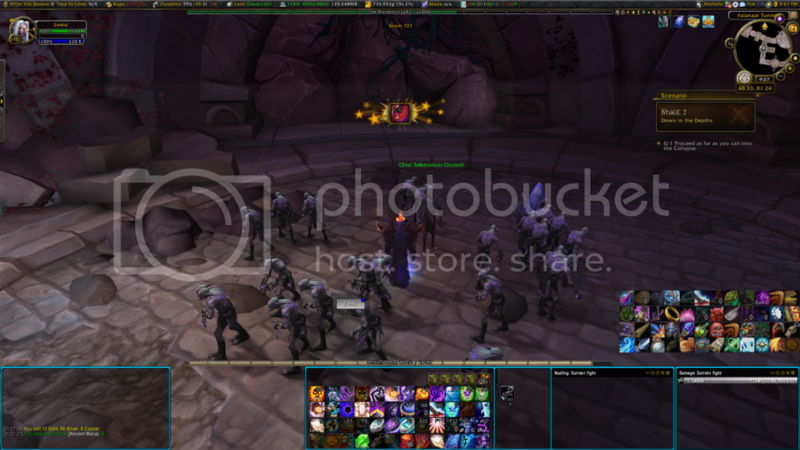 ~ 40 quest in main Suramar storyline. You need Uraltes Mana to start this world quest. You will get Manawahrsagestein from Shal'Aran, early in suramar storyline and will be able to collect mana from items on the ground. The best farmspot for me is Suramar city. Collect Twice-Fortified Arcwine (100-150 Uraltes Mana in 1 item, Leypetal Bloossom (30-60 Uraltes Mana) some gems and so on. I think this place after honored is the best: https://www.youtube.com/watch?v=QdPyhhe9aLI Will update this part later with more info. Ausbildung der Verdorrtenarmee is a special World Quest Scenario in Suramar, associated with Die Nachtsüchtigen faction. The first time you do the scenario will be via a quest that is part of the overarching Suramar story questline - Aufbauen einer Armee. After you complete this one-time quest, you will get access to the World Quest, Ausbildung der Verdorrtenarmee, roughly every 3 days in Suramar. This is the Legion equivalent of the Zitadelle des Donnerkönigs scenario from Mists of Pandaria for those who remember that. The biggest reason to do this scenario is for reputation with Die Nachtsüchtigen. You can get a maximum of 425 reputation + 50 for the World Quest (not factoring in any reputation buffs you might have). You need 8000/12000 Honored reputation to unlock the attunement for the Mythic-only dungeons Der Arkus and Der Hof der Sterne. Segen des Manasuchers is a shoulder enchant available at Honored with Die Nachtsüchtigen, and gives the chance to obtain enchanting materials, potions and flasks from mobs killed. The very first time you do the scenario (via the Aufbauen einer Armee quest) there is no cost. The World Quest requires a minimum of 400 Uraltes Mana, with a maximum of 2000 Uraltes Mana. As outlined by varenne, the more mana you invest, the more Verdorrter Exilants you get in your army, which is important (as explained below). The Verdorrter Exilants in your army act as both a boost to your damage dealt (as they will attack your target) and a "currency" with which you can obtain certain chests. As aforementioned, the size of your starting army (for the World Quest version) is determined by the amount of Uraltes Mana you invest at the beginning (a minimum of 8 Verdorrter Exilants for 400 Uraltes Mana, to a maximum of 20 Verdorrter Exilants for 2000 Uraltes Mana). For all intents and purposes, there is no reason you shouldn't be investing the maximum amount of Uraltes Mana your mana cap will allow. Any damage that a Verdorrter Exilant takes is permanent. Attempts to heal it up will appear to work initially, but after a few seconds the healed HP decays and returns to the previous value. Your army has two modes - Folgt mir! and Chaos!. By default they are on Folgt mir!, but can be switched to Chaos! when you activate the Extra Action Button. Chaos! is a great way to nuke down larger mobs or bosses. Chaos! makes your army run around willy-nilly in a small area and aggro anything they encounter. As such, it is highly advisable you clear all the lesser trash in a room before activating this to nuke a bigger target. Make sure to switch back to Folgt mir! before moving into a new area, so you don't leave your army behind! Your very first run will be via the quest Aufbauen einer Armee. You will have a fixed army size of 8 Withered to begin with. Your goal for this run should be to get 1 or 2 medium chests (the ones simply designated "Treasure Chest"). These require 5 Withered each to carry out, so to get a second one you will need to recruit a couple more Withered if you can. Your very first run is free - you only have to start paying Uraltes Mana when you do the World Quest. As such, it's not optimal to be capped on Uraltes Mana when doing this the first time, as you will have chances to pick up mana during the scenario and should have space for it. Arkane Munition (2.5-second cast) - throws an orb that does AoE damage. This cast is interruptible, and should ALWAYS be interrupted somehow. Instabile Explosion (4-second cast) - this is an AoE explosion that the wraith will cast when close to death. To avoid this you must either stun it at low health or nuke it before it completes the cast. Make copious use of Chaos! when dealing with these mobs. After finishing the above quest, you should get the World Quest shortly after for a second chance at the scenario. This time, you will have to spend some Uraltes Mana. Until you have some of the above upgrades, I would not advise going too far into the ruins. I had the misfortune of unexpectedly running into Leypirscher Dro; he has 25+ million health and wreaks havoc with your army. He also hits pretty hard (at least of a non-plate wearer). The first time I encountered him, I died without looting any chests, and that feels like a real waste. Leypirscher Dro will randomly appear once you reach a certain point in the scenario (past at least 3-4 chests in the ruins) - there is no way to see him before he appears, or predict when this will happen! You can see the maps I've made below to see where Leypirscher Dro will spawn - there are enough chests before this that you don't have to venture into that territory for your first runs. Berserkers are obtained from 2 permanent upgrades from the Large (Glimmering) chests. These are Berserkerhelm von Taenna and Berserkerhelm von Ondry'el. Kristallines Schrapnell (Non-interruptible) - puts a glowing circle around the target (hopefully you! ); after 4 seconds, explodes doing AoE damage. Simply move away from your Withered if you get this debuff. Contains 1 (large, 10 Withered) Glimmering Treasure Chest (#1) with Berserkerhelm von Ondry'el inside. Some of these patrol back and forth; tag them and pull them individually into the ramp tunnel, and use Chaos!. Just before going down the ramp into the tunnels, there is 1 (large, 10 Withered) Glimmering Treasure Chest (#2) with Zaubermaske von Azsylla inside. DANGER - After this room (as marked by green circles on the map) Leypirscher Dro can appear!!! Blendende Klingen (Instant) - Charges around, attacking your Withered, and gains 300% attack speed for 5 seconds afterward. Orphische Verschiebung (Instant) - Similar to a Schattenschritt. He can be revealed with Geistersicht (Dämonenjäger). There are a number of ways to kill him; if you have stuns available, a pet to tank him, and heavy burst damage (e.g. Kampfrausch/Zeitkrümmung/Heldentum) you can nuke him before he kills you. It is most important to kite him immediately after he uses Blendende Klingen given his attack speed buff. Chaos! is absolutely essential to help kill him quickly. It is important that you are in a room you have already cleared of trash before using this - hence, kiting him back a ways is advised. He drops Dros Schlüssel, which is required for a door later in the scenario, granting access to the second half of the instance. This key is removed from your inventory after you exit the scenario - as such, you have to kill Leypirscher Dro each time you want to use the key. You may be able to open this chest without pulling Leypirscher Dro. Anwachsende Brut (Non-interruptible) - spawns many small adds. If this is successfully cast, simply AoE them down. Spaltende Klauen (Interruptible) - cleave damage. Should be interrupted. Inside is 1 (large, 10 Withered) Glimmering Treasure Chest (#3), which contains Scheibe des Sternrufers. At the west end of this hallway is 1 (large, 10 Withered) Glimmering Treasure Chest (#4), which contains Linsen von Zauberseher Dellian. This is just outside the door that requires Dros Schlüssel to open. Cast Fluch der Seide, which reduces haste. There are 3 of these grouped up behind the boss (Instabiler Gespensterfürst). If possible, drag the boss out of the room and eliminate him outside, then come back and deal with these remaining mobs. Identical mechanics to Instabiles Gespenst, just bigger and badder. Contains 1 (large, 10 Withered) Glimmering Treasure Chest (#5) with Zaubermaske von Alla'onus inside. Seidenhexe der Fal'dorei X 1 in the center. Contains 1 (large, 10 Withered) Glimmering Treasure Chest (#6) with Berserkerhelm von Taenna inside. The door in the opposite direction (leading to Room 10 and Furog der Elfenbrecher) will open once you kill the Seidenhexe der Fal'dorei. Verdorrten ergreifen (Non-interruptible) - will pick a Withered and deal heavy damage-over-time to it. Stampfen (Non-interruptible) - deals 15 yard radius AoE damage and a knockback. Spinnlingtoxin (Instant) - stacking poison DoT. There are two flights of stairs up to the last boss, Psillych, with a landing in-between. This portion is a gauntlet, as there are an endless stream of Psillychspinnlings coming down the stairs constantly. Netzschuss (Non-interruptible) - puts a number of webs on the floor. Simply avoid them, as they will slow and deal ticking damage. Open the door to Room 3 (with Lapillia in it) if you have 10 Withered, but don't go in. Go down the ramp to the tunnels (Room 4). Clear the Room 4 top area of mobs - pull each Instabiles Gespenst into the ramp hallway so you can safely use Chaos! on them. If you already have Linse von Qin'dera and Kasten des beruhigenden Geflüsters, OR you have 25+ Withered, proceed to Step 9. If this is your VERY FIRST run (i.e. if you were doing Aufbauen einer Armee and only started with 8 Withered), this is where you should stop and grab some chests. Go for Chest "B" first. This will contain Linse von Qin'dera. Go for Chest "D", in Circular Hallway 1. It has a little bit of trash near it and there is a small chance you will pull Leypirscher Dro when going for this chest, but it contains Kasten des beruhigenden Geflüsters, which is a HUGELY useful upgrade. A safer, but less useful goal is to go for Chest "C" in Room 4. This contains Banktruhe des Reisenden, that will set up a personal bank in Shal'aran. Clear the edges of the room, picking up the few Withered there. Try to avoid prematurely aggroing Lapillia, but it's not the end of the world if you do. Kill her, using Chaos! to burn her down. Move away from your army if targeted with Kristallines Schrapnell. Head back to Circular Hallway 1 and start clearing it. Note that at any point from here on, Leypirscher Dro can appear. After you reach the 4-Way Intersection, clear the area of the two Instabiles Gespensts, one-by-one. Open the door to your left (to Room 6), but don't go in yet. Clear Circular Hallway 2. Head down the stairs at the end to the west end of Room 7. If you haven't encountered Leypirscher Dro yet, he will be in Room 7. Head up the stairs and forward into Room 6, where Brutwächter Phyx is. Clear the trash in the front of the room, and then tackle Brutwächter Phyx. Be sure to use Chaos!. Prioritize interrupting Spaltende Klauen, and stun during Anwachsende Brut if possible. AoE down the adds if Anwachsende Brut is successfully cast. Next move out and back into Circular Hallway 2, and then into Room 8. Tag the lone Seidenhexe der Fal'dorei/Verschlinger der Fal'dorei mobs and pull them into the hallway. Next tag the boss (Instabiler Gespensterfürst), and interrupt it to pull it into the hallway. Use Chaos! for each of the previous. After taking these out, move into the room and AoE down the 3 Seidenhexe der Fal'dorei with Chaos!. This room has packs of 2-3 Instabiles Gespenst, which makes heavy AoE and AoE silences/stuns/knockbacks a real asset to ensure they don't do any major damage before they die. Next pull Furog der Elfenbrecher into this hallway when he patrols close enough. Burn him down as fast as you can, watching out for Verdorrten ergreifen and Stampfen, stunning him to interrupt both if possible. After clearing the room and collecting some extra Withered, you must run the gauntlet on the south stairs out of this room. This involves two flights of stairs with constantly spawning Psillychspinnling adds, that will easily overwhelm you if you stay in one spot. A strategy that can work is to use Chaos! to clear mobs of spiders, then move up the stairs and use Folgt mir! to gather your Withered to you. When the Psillychspinnlings build up again, switch to Chaos! to clear them, move up the stairs some more, switch to Folgt mir! mode, rinse and repeat. Psillych casts Netzschuss; there is no need to stop this, simply avoid standing in the webs or pulling your Withered through them. Make sure to use consumables - food buffs (see here for an overview of Legion foods), potions and flasks (Fläschchen der zehntausend Narben, Fläschchen der zahllosen Armeen, Fläschchen des geflüsterten Pakts, Fläschchen des Siebten Dämons) can help your runs go much smoother. Uralter Heiltrank can be a HUGE boon in this scenario - it's great for getting out of tight situations. You should ALWAYS obtain the Leylinienmeisterschaft buff from Arkanistin Valtrois in Shal'aran - granted when you feed her for the daily Valtrois nähren quest, but also available from her by speaking to her at any point, for a meager 10 Uraltes Mana. A single proc of this will recoup the mana you spent to get the buff - just make sure to stand in the Leyline Rift! The Zauberschutz der Ersten Arkanistin, obtained from Erste Arkanistin Thalyssra, should now work in the scenario, as reported by some users. My experience has been otherwise, and it's possible that sometimes it will trigger and other times it won't. It's best to not have to rely on it. If you need extra Uraltes Mana to get a higher Withered count and do not have the time/inclination to go farm it, keep in mind that Uralter Manakristall and Uraltes Manajuwel are tradable, and will be available on the Auction House. Berserkerhelm von Ondry'el (Chest #1, 10 Withered) and Berserkerhelm von Taenna (Chest #6, 10 Withered), in any order. Zaubermaske von Azsylla (Chest #2, 10 Withered) and Zaubermaske von Alla'onus (Chest #5, 10 Withered), in any order. As my maps show, there are a number of other doors further in the instance. Other than the one door requiring Dros Schlüssel, the remaining doors require at least 10 Withered. If your aim is to go deep into the tunnels, make sure you don't dip below 10! Linsen von Zauberseher Dellian appears to not be working properly. After you obtain it, you will not see any further "hidden" chests within the scenario; therefore it is a largely useless upgrade at present. You can therefore skip Chest #4 (see maps in the "Room-by-room" section) and go for other ones. Don't forget that time is not a factor - you can wait for DPS cooldowns, on-use trinkets, CC etc. to come off of cooldown, and in some cases it may be worthwhile to wait on Kampfrausch/Zeitkrümmung/Heldentum for a particularly nasty boss. To improve the rate of reputation gain, don't forget reputation buffs. The reputation from the scenario is granted in the form of tokens (Arkane Tafel von Falanaar and Arkanes Überbleibsel von Falanaar) which can be saved and used once any reputation buff is up. There are certain abilities that will boot you from the scenario - avoid using these! This includes Schattenmimik and Totstellen, and possibly Verschwinden as well. After you have obtained the chests beyond Room 10, there is NO reason to go into those rooms again and kill Furog der Elfenbrecher and Psillych. I have found that you lose more Withered than you gain by doing those rooms/bosses. You can really only make so much progress with a limited army you get to start with, I screwed up multiple runs getting my army completely ransacked by Dro or Furog the Elfbreaker trying to see how far I could get. My advice here is to just take your starting army and slowly work your way until you reach the fear reduction item Besänftigender Leysteinsplitter at the start of the central chamber in Falanaar Tunnels. If you are feeling very ballsy have some good gear and are playing a high burst class with, preferably, multiple stuns, or heroism (do drums work? need to test that :P) then you can make the push past Dro, and get to Furog and call it a day there, your ultimate goal being 20 withered. By this point you should have more than enough points scored for the 4 Arkane Tafel von Falanaar max reward, and if you hug the left wall very sneaky like, you can jump the broken pillar and make your way around to the medium chest there containing the lovely Linse von Qin'dera, then GTFO and grab the other two chests I mentioned for reduced fear & the berserker. Have gotten the Linsen von Zauberseher Dellian twice now. Don't know for what good it will do. Have now gotten all large chests and only missing 1 medium chest. so will check at next run if having 2 lenses show any more chests and will update this post with any results. Stick around and run back through after you clear it.The tiny chests that take no wither to return continuously respawn. Good source of farming profession patterns and Blut von Sargeras. Glitzernde Schatztruhe seems to be the main link for the max chest. Just recieved Gletscherreißzahn after completing this, had about 400 points. Erste Arkanistin Thalyssra would like to use the Public Service Announcement above to repeatedly remind you of that possible outcome for your withered. Uraltes Manabecken >> Toy (/way 67 52 second floor, Behind Brood Guard Phyx) this one says big end chest, but I'm pretty sure I got this toy off it, gotta check it out again. With these in mind, you'd want to get the Besänftigender Leysteinsplitter as fast as possible, as losing Withered due to the Fear debuff, in middle of a boss fight is awfull. With it you lower the chances to that to happen close to none. This world quest is unlocked by completing the quest Aufbauen einer Armee. 7) Withered bonuses... These are up to you. I do recommend getting Besänftigender Leysteinsplitter on your first run, to reduce the fears caused by our friendly neighborhood spider boss. Other than that, I do not think the others are very relevent any more. You are just going to plow though this scenario now with or without the bonuses!